Information from Carl Zeiss Documentation. In the past, cleaning agents such as ether, chloroform, etc. were considered to be a universal remedy. Though these agents are quite effective for many types of dirt, they can no longer be used for health reasons and reasons of environmental law. Mainly staff having contact with customers should not use these agents. This would create the impression that CZ disregards environmental regulations. must be performed systematically. The procedure is described in the following table. If the type of dirt is known, cleaning can be performed using selected chemicals (see immersion oils, removal of paints and auxiliary cements). You may only use such means which do not damage the optical surface. Cleaning agents can cause mechanical damage, but it is also possible that chemical agents, e.g. silicone, negatively affect the optical system. For the cleaning of optics, only 100% cotton may be used. It is also important that the cloth is not impregnated. Therefore, new cotton cloths must be washed before they are used. Fiber-protecting agents, e.g. conditioners, should always be dispensed with. In stationary devices, vacuum tweezers or PTFE (Teflon)-coated suction devices are used. To check the cleaning results, magnifiers with 3x or 6x magnification are used. In stationary workstations, a stereomicroscope can be used to check the optical cleanliness. In these cases, a reticle is inserted into the beam path for defect detection. Many types of dirt can be removed by breathing on the surface and then using a piece of cotton wool or a soft cloth for cleaning. Water containing tensides (commercial cleaners, e.g. Palmolive or Fairy Ultra) can be used to support the process. Cleaning using a standard household cleaner for glass has also proven to be effective. Can be used as a mild cleaning agent. It does not attack polymers, cements and paints. It is suitable for minor dirt, e.g. fresh finger prints, minor greasy dirt and the like. Ethanol is also known under the following synonyms: alcohol, ethyl alcohol and petroleum ether. S-phrases 7-16 Keep container tightly closed. In the case of continuous and longer use of ethanol, make sure that the industrial safety limit value of 500ml/m3 or 960 mg/m3 is not exceeded. Hand and eye protection must be chosen for workstations, specifically depending on the substance concentration and quantity. Furthermore, the staff must be instructed every year in the use of this substance in accordance with § 20 of the hazardous substance ordinance. Through the Göttingen plant, department MG-LAB. Ethanol is available from all suppliers of chemicals and in drugstores. As purity class, absolute ethanol for analysis (p.a.) should be chosen. The optics cleaning mixture is also a mild cleaning agent which does not attack surfaces or polymers. This cleaning mixture is produced of 90 Vol% benzoline and 10 Vol% isopropanol (IPA). It is ideal for the removal of grease, oils and Immersol 518 F.
S-phrases: 7-16 Keep container tightly closed. In the case of continuous and longer use of the cleaning mixture, make sure that the industrial safety limit value of 500 ml/m3 or 960 mg/m3 is not exceeded. Hand and eye protection must be chosen workstations, specifically depending on the substance concentration and quantity. Furthermore, the staff must be instructed every year in the use of these substances in accordance with § 20 of the hazardous substance ordinance. mixture L are available from suppliers of chemicals and in drugstores. For analysis (p.a.) should be chosen as purity class. Acetus is also a cleaning agent which is ideal to remove grease or other organic dirt from glass surfaces. On account of the high portion of acetone, you should be careful with adjoining polymer-containing or painted surfaces. You should check an inconspicuous area whether it remains unaffected by the solvent. Acetus is produced of 60 Vol% acetone and 40 Vol% ethanol. Ethanol: alcohol, ethyl alcohol and petroleum ether. sources. No smoking. Do not breathe vapor. ml/m3 or 1200 mg/m3 for acetone and 500 ml/m3 or 960 mg/m3 for ethanol are not exceeded. Hand and eye protection must be chosen for workstations, specifically depending on the substance concentration and quantity. Furthermore, the staff must be instructed every year in the use of these substances in accordance with § 20 of the hazardous substance ordinance. from suppliers of chemicals and in drugstores. For analysis (p.a.) should be chosen as purity class. from glass surfaces. On account of the high portion of acetone, you should be particularly careful with adjoining polymer-containing or painted surfaces. You should check an inconspicuous area whether it remains unaffected by the solvent. The optics cleaning mixture is produced of 90 Vol% acetone and 10 Vol% isopropanol (IPA). S-phrases: 9-16-23-33 Keep container in a well-ventilated place. Keep away from ignition sources. No smoking. Do not breathe vapor. with § 20 of the hazardous substance ordinance. mixture are available from suppliers of chemicals and in drugstores. For analysis (p.a.) should be chosen as purity class. Fungus settles on all surfaces. High air humidity and temperatures around 37°C are ideal for the growth of fungus. Therefore, it is absolutely necessary to store optical systems in a dry place. If fungus has settled on a surface and spread its mycelium, the optical system is past remedy in most cases, since the mycelium and the metabolic products of the fungus damage the glass surfaces. Therefore, the fungus cleaner must be used prophylactcally. The frequency of its use depends on the ambient conditions. All the above cleaning agents (solvents) are subject to the transport regulations (GGVS or ADR) which must be observed in any case. If these regulations are not observed, the transport company or the forwarder (the one who handed over the hazardous substance) must expect severe penalties. – The containers must be properly labeled. – Only leak-proof glass or aluminum bottles may be used for packaging. – The inside packing (bottle) must not exceed the volume of 1 liter. – The delivery package (outside packing) must not exceed the volume of 12 liters or 20 kg. – The outside packing consists of a standard cardboard box with UN sticker. – Furthermore, the relevant information must be included in the delivery documents. – Detailed information about this subject can be obtained from the person in charge of hazardous goods. that cleaning is performed in a place which is not affected by draught. For the cleaning of optical surfaces, only the agents (or comparable ones) described in this manual may be used, since otherwise major damage may occur. The optics to be cleaned should never be held with your bare hands. Contact with the skin should be avoided, since otherwise the cleaning results may be affected. Coated surfaces must always be cleaned with a wet cloth. wad can be made more compact by turning it inside a cotton cloth. The length of the cotton wad depends on the size of the surface to be cleaned. Standard value: the cotton wad should cover half the surface to be cleaned. The cotton wad produced in this way is dipped into the cleaning solution. Ensure that the entire cotton wad is wetted with the solution. Avoid pressing it out at the vessel wall so that the cleaning solution is not contaminated. Furthermore, the cleaning solution should be replaced in regular intervals, since small particles from the cotton wad gather in it because the cotton wad should not be too wet and not too dry for cleaning. Optimum humidity is achieved by dabbing the cotton wad on a cotton cloth. Always clean the optical surface by moving in circles starting in the middle. Slight pressure should be exerted on the optics during cleaning. When cleaning through rotation (motorized mounts), the cotton ball must also be moved from the center to the edge. However, the rotation direction of the optics is also important. 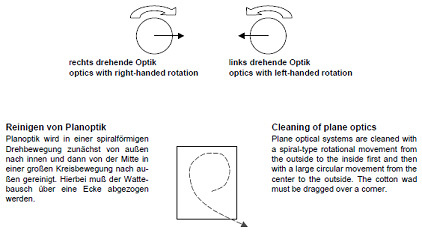 In the case of right-handed rotation, cleaning is performed from the center to the right, and from the center to the left in the case of left-handed rotation. The cleaning results should always be checked under a good light source. Halogen lamps have proven to be suitable for this purpose. The light should be obliquely incident (the surfaces are reflected). If such lamps are not available, reflection of the optics can be achieved by holding it against a bright illuminated window. When viewing the optics with a magnifier, any available dirt is particularly visible near the bright/dark border (edge of the window). In the case of strongly curved lenses, checking should be performed in transmitted light. Further checking is possible by breathing on the surface. The formed fogging must be homogeneous. There must be no formation of spots or “islands”. The fogging must also homogeneously disappear from the cleaned surface in a single front. In general, old optics must be treated in the same way as the current line. However, the cement of some old objectives may contain Canada balm. This is recognized by the amber color of the cement. In this case, watery cleaning agents are always recommended.